From the tallest building in Honolulu you can see for miles. Stop by the pool to cool down after the day packed with action. There's space for group activities and for everyone to do their own thing. Aqua Skyline at Island Colony is the tallest resort in Honolulu at forty-four stories with some of the best views of the area. You’re just two blocks from the beach and surrounded by the area’s best shopping and dining. Get your day off to the right start with a stop at Jagger’s Cafe, the on-site coffee shop. Lounge on the sundeck with the latest issue of People magazine or take a dip in the outdoor pool. Have a family cookout on the BBQ grills and let the kids help out with burger and hot dog assembly. After lunch, let the aches of everyday life melt away in the sauna or hot tub. The resort has a well-equipped fitness center allowing you to get your cardio on (and enjoy all of the delicious meals at nearby restaurants guilt-free)! Air-conditioned studio and one-bedroom condos sleep, four guests. Kitchenettes with mini-fridge, microwave, and two-burner stove allow you to prepare basic meals like DiGiorno pizza and Kraft macaroni and cheese. In-suite entertainment includes flatscreen TVs with cable and DVD players. Bring favorite movies from home, or check out the selection of DVD rentals available at the resort. Let one of the kids pick the first movie while another one chooses snacks. Pack light and take advantage of the on-site laundry facilities at the resort. Think of all the extra space you’ll have in your suitcase for souvenirs! At the end of the night, gather the family on the private furnished lanai and watch the sunset. 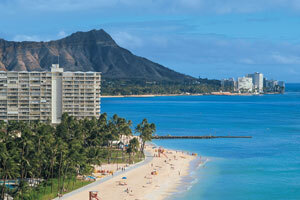 Looking to escape the hustle-bustle of Honolulu for a day? Take the shuttle to Ala Moana Shopping Center for a day of retail therapy. Department store lovers will have their pick of Bloomingdales, Neiman Marcus, and Nordstrom. Little ones will have a blast at Toys R Us Express and the Disney Store. Chanel, Prada, Burberry, and Chanel are some of the high-end brands featured at Ala Moana. For those who love a good bargain, Target has you covered. Need an afternoon pick-me-up? Grab a latte or iced blended at The Coffee Bean & Tea Leaf. Animal lovers will enjoy the Honolulu Zoo. It’s forty-two-acres and has several species such as American flamingos, chimpanzees, ring-tailed lemurs and two-toed sloths. Ala Wai Golf Course, located just across the canal, has everything you need to hone your golf game. This eighteen-hole course is perfect for all skill levels, and the on-site pro shop will be happy to assist you with equipment rentals.